Take a teddy bear and get him wearing the green! Voila, St. Patrick’s Day cupcake. What You Need: 1 cupcake; green frosting; chocolate frosting; 1 red hot candy (round); 2 red hot candies (heart shaped); 6 green mini M&Ms; 2 candy eyes or small white candies; pastry bag with coupler and #5 and #2 metal tips. How to Make It: Frost cupcake green. 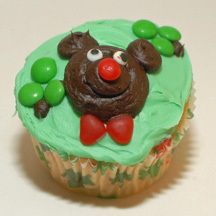 Use chocolate icing and pastry bag with round #5 tip to pipe a bear face, muzzle and two ears. Add eyes and red nose. Place 2 heart-shaped red hots with points facing to form bow tie. Arrange 3 green mini M&Ms in two areas to form shamrocks. Use #2 metal tip to add chocolate stem. This entry was posted on Sunday, February 22nd, 2009 at 12:01 pm	and is filed under animal cupcakes, St. Patrick's Day cupcakes. You can follow any responses to this entry through the RSS 2.0 feed. Responses are currently closed, but you can trackback from your own site.